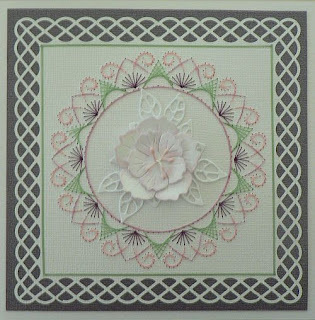 The pattern stitched is a389, Stitching Sheet book #13 and is available from Ann's Paper Art. Marianne Creatable die LRO-200 has been used along the bottom, I have cut and embossed this 3 times. 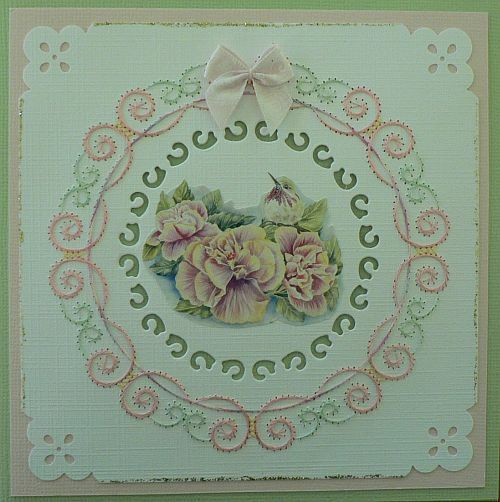 Marianne Design decoupage MB 0134 which has been lightly chalked around the edge in pink. Along the edge I have use Stickles Glitter. 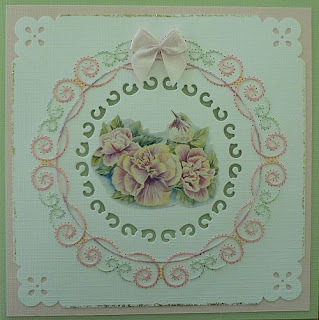 This card was made for a lovely friend by the name of José who lives in The Netherlands. The dies that I have used are from Cheery Lynn, Dainty Dutch Deco DL141, Cheery Blossom B129, Olive Branches B147. 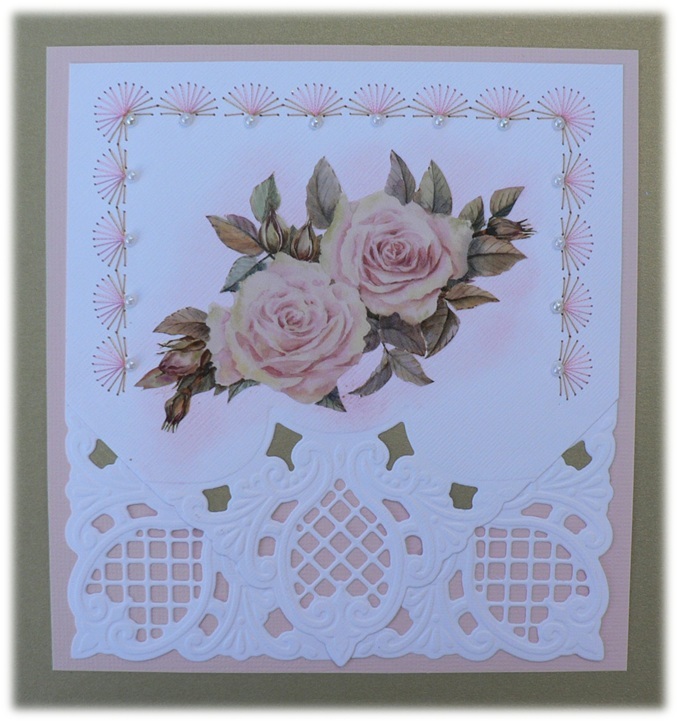 This card was made for a lovely friend by the name of Annalie who lives in South Africa. The pattern stitched is a607 from Ann at Ann's Paper Art. 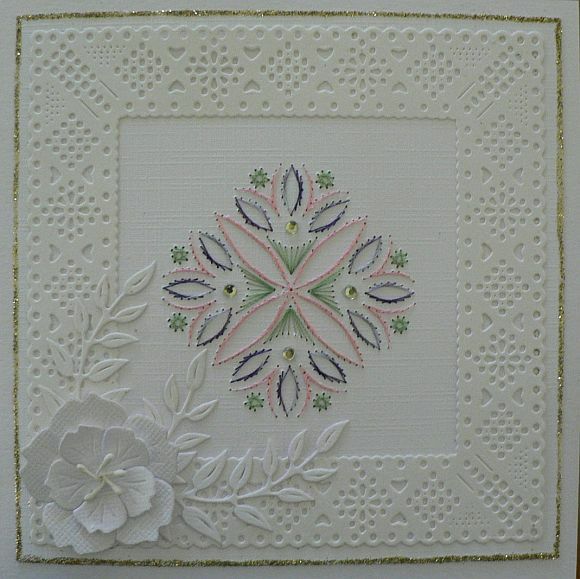 I have also used the leaves from Marianne Creatables, Flower Fantasy LRO128. Hobbydot line sticker series 1 along the edge to help finish the card. Hello my name is Sharon, my husband and I share our home with 2 adorable British Shorthair cats. 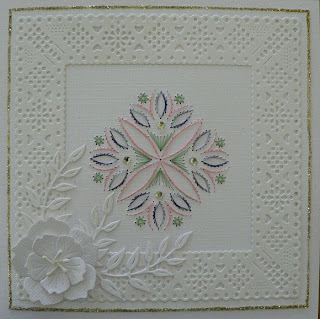 I do a lot of embroidery and that is why I find stitching on cards to be fun and creative. I would like to thank-you for coming by and looking at my craft cupboard. Visit My Craft Cupboard's profile on Pinterest.